Today's NFL fans have more viewing options than ever before. Each and every week, football addicts plant themselves in front of big-screen, high-definition TVs and watch the game they love unfold via slow-motion replays and multiple camera angles, pausing and fast-forwarding the action on their DVRs as they please. Yet while more and more football fans are watching the NFL each week, many of them don't know exactly what they should be watching. Take Your Eye Off the Ball is not a beginner's introduction to football, nor is it a technical manual for only the most studious of fans. 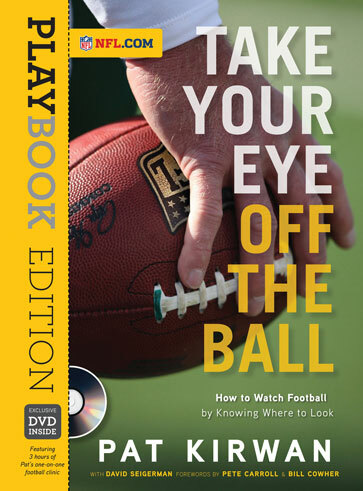 Instead, it clearly and simply explains the intricacies and nuances that affect the outcomes of every NFL game. Pat Kirwan, one of the nation's most well-respected and popular NFL analysts, is the co-host of Movin' the Chains on Sirius NFL Radio and a featured columnist on NFL.com. Since 2003 he has been an editorial contributor to the NFL Today on CBS and makes frequent appearances on TV and radio programs across the country, including ESPN, the NFL Network, and Sporting News Radio. Prior to joining CNN/SI in 1998, Pat spent 25 years working in football, coaching at the high school and college levels before joining the New York Jets' staff as a defensive assistant coach. He eventually moved into the front office, becoming the team's Director of Player Administration. The father of three grown children, Pat lives in the New York area with his wife Janet.David Seigerman is a veteran sports journalist whose writing career began in newspapers (Newsday, Jackson Sun) and moved on to magazines (College Sports Magazine). In 1996 he moved from print to broadcast media, becoming a field producer for CNN/SI and eventually the managing editor at College Sports Television. Since 2003, he has been a freelance writer and producer, and co-wrote and co-produced the feature-length documentary, The Warrior Ethos: The Experience and Tradition of Boxing at West Point. He lives in Larchmont, New York, with his wife Elizabeth and their two children.